We all know the problem to many USB flash drives to fit in your pocket. 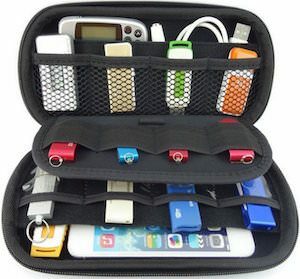 But now there is the handy storage pouch that can hold more then 12 flash drives and besides that other stuff as well like wires, credit cards and maybe even your phone. The thumb drive storage is made from waterproof PU leather and that of course keeps your storage a bit more secure and protected from danger. No longer do you have to wonder where you put that flash drive because this pouch can hold all you need on a daily bases. Come and take a closer look at this USB Flash Drive Storage Bag.